Nikon D810 is one of the best DSLRs that Nikon has ever produced, and is perhaps only overshadowed by the more recent D850. The arrival of the D850 is good news for those who'd like the D810 as prices have been dropping in recent months. 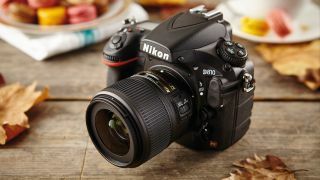 We’ve looked through your favorite retailers to bring you a reliable selection of the best prices and camera deals for your new Nikon D810. The D810 will rise to the occasion in a diverse range of environments. Thanks to the superb resolution and epic 36.3 megapixel image quality, you’ll be ready to take on everything from horizon-stretching landscapes to extreme floral close ups without getting pollen all over your lens – or a facefull of bee. *DCW can not promise the Nikon D810 will protect from angry bees. Don’t be thinking you’ll need a separate pricey snapper in your bag should things step up a gear though. The Nikon D810 can handle faster subjects like live sport and moving wildlife thanks to the excellent noise control complimented by an autofocus that’s reliable and fast – even in low light conditions. With a battery capable of capturing up to 1200 images between charges, the Nikon D810 is fantastic for a few days’ worth of shooting on your holidays and should be plenty for most professional photographers for a day at the studio or out in the field. So there you have it, the D810 is one of Nikon’s finest and indeed still one of the best full-frame DSLR cameras on the planet. Take a look below for the best deals out there.